Are British doctors among the best paid in the world? "Patient support group Patient Concern said doctors in Britain were among the best-paid in the world." "Thousands of strike doctors earn more than the PM (and hundreds are on more than £250,000)." This Thursday will see the NHS pensions dispute come to a head when doctors across the UK take part in industrial action - the first time they have done so in 40 years. Amidst this morning's reports about doctors' salaries, the Patient Concern group supposedly claimed that doctors in Britain were among the best paid in the world. Full Fact contacted the Patient Concern group to ask where their claim originated from. However, the organisation refused to give us any more details besides claiming that it had been taken from "various news reports" since 2004. "Britain is failing on strokes, dentistry and hospital beds... while paying GPs more than any other developed country." The figures mentioned in the article came from a report by the Organisation for Economic Cooperation and Development (OECD) which compared the renumeration of doctors around the world, broken down into general practitioners and specialists. That report, using data sources from each of 21 different OECD countries, compared the 'net income' (i.e. after social contributions such as income tax had been deducted) of doctors relative to the average wage in each country as a whole. On this measure, the UK did indeed top the list, with doctors paid 4.2 times the average wage based on 2007 figures. It's worth bearing in mind straight away the difference between "self-employed" and "salaried" GPs as presented by the OECD. Self-employed GPS include 'contractor' GPs - those GPs that have entered into a contract with a Primary Care Organisation (PCO) to provide primary care services. 'Salaried GPs' meanwhile can be employed either by Contractor GPs or directly by the PCO. In either case, the statistics available only include a sample of GPs - both self-employed and salaried - who have completed a self-assessment tax return. 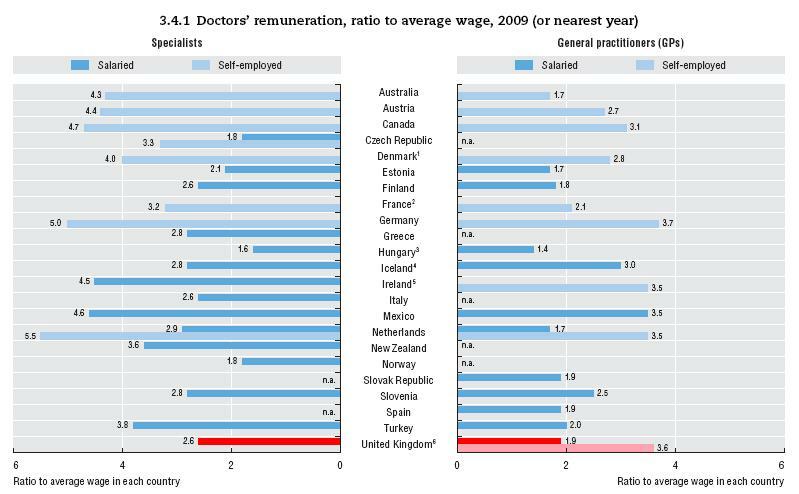 As can be seen from the table, taking the "self-employed" category of GPs (on the right-hand side) does show the UK's general practitioners amongst the best paid in the OECD countries sampled - as a proportion of the average wage in their country. However, the case is much less pronounced when we consider "salaried" GPs and specialists who, while still above average among the countries, don't stand out nearly as much. So can we trust the data? The OECD are transparent about the caveats to the data they provide. For instance, measuring 'renumeration' [income after taxes, etc] can result in underestimating the initial gross incomes. Furthermore, any 'practice expenses' incurred by contractor GPs (such as employing a salaried GP) are included, and can also affect the results. It's also important to consider that, as mentioned above, the data for UK doctors is only based on self-assessment tax returns rather than palroll salaries for Primary Care Organisations. This could give a skewed picture as the renumeration of Salaried GPs tends to be less than that of Contractor GPs, so the actual pay for UK doctors as a whole could be somewhat less than four times the average wage. Even more up-to-date figures are also now available following the publication of GP Earnings and Expenses 2009/10 from the NHS Information Centre. These show that average annual earnings for GPs are now £105,700, up from £105,300 in 2008/09 - which the OECD's last release was based on. So GP's earnings still remain around four times the median income of £25,882 in 2010 for a full-time worker, which is fairly consistent with the data from the OECD. Whether the case has changed for the other countries in the same time however is something we do not yet know. The evidence, although imprefect, does suggest that some UK doctors are among the best paid within developed countries as a proportion of the average wage in each country. However whether or not we can necessarily apply this to most Salaried GPs, who tend to earn less than self-assessed Contractor GPs, is another matter. There is certainly evidence that the Salaried GPs that do show up in the statistics, having completed self-assessment tax returns, are more modestly paid compared to their peers in the developed world. The debate over whether doctors' pensions are fair is of course separate and rages on. Are we paying for NHS staff's posh cars? Is the NHS pension scheme a drain on the taxpayer? Are NHS pension figures 'skewed'? Has the NHS paid out nearly £20 million in compensation to staff? Are 2.5 million 'ghost' patients costing the NHS £162 million? How much will the NHS reorganisation cost? Did NHS spending on managers rise by 450% under Labour?